MPL Koha Patch | A WebExtension developed for Firefox and Google Chrome for the staff of the South Central Library System. A WebExtension developed for Firefox and Google Chrome for the staff of the South Central Library System. The MPL Koha Patch is a WebExtension built for Firefox and Google Chrome which augments the display of LibLime Koha to make various tasks more convenient for library staff. While it is developed for use by member libraries of Wisconsin’s South Central Library System, it is not supported by SCLS, but is an independent project by a Library Page at Madison Central Library. This extension comes with several features that cannot be disabled. After installing the MPL Koha Patch you will notice an icon at the top right of the screen. By default it will show the Madison Public Library logo, but this can be changed on the extension preferences page. There are a number of tools and links to frequently used websites that can be accessed from this dropdown panel. Clicking this link will open a fillable SCLS Problem Item Form in a new tab. Both the patron and item data can be automatically retrieved from the barcode by clicking the button that appears after each respective field. If the item is currently checked out, retrieving data from the item barcode will also automatically retrieve last patron data. Due to restrictions in accessing another library's item use data, use must be manually entered. When completed, the form may be sent to your receipt printer. Further instructions will appear after printing based on the type of problem (e.g. Damaged Item found in Book Drop, Parts Missing item that arrived via Transit Hold, etc.). From any other page in Koha, there are two additional ways you can initiate the Problem Item Form. Any hyperlinked barcode number and any highlighted barcode number (i.e. selected text as when copy/pasting) may be right clicked and from the context menu you may select "Use Barcode in Problem Item Form." Not only will this open the problem form in a new tab, but it will also automatically start gathering either patron or item data based on the barcode that was selected. This link will automatically generate the note for setting up a Madison Public Library payment plan if you are currently editing a patron's record. A popup note will ask you to enter the initial balance on the patron's account, and the extension will fill in the rest. This link will automatically generate both the circulation and OPAC notes to notify a patron that their library card was found. Just enter the name of your library location in the subsequent popup note, and the extension will fill in the rest. You must be currently editing a patron's record to use this tool. When patron's have separate residential and mailing addresses, it is customary to enter the mailing address in the primary address fields, and their residential address in the alternate address fields. For statistical purposes, the "sort 1" (PSTAT) value should be based on the residential address and not the mailing address. Since the PSTAT is normally automatically found using the primary address (assuming you have enabled this feature) this link is necessary to find the PSTAT when the mailing address and residential address are different. You must be currently editing a patron's record to use this tool. This link is used to automatically select all of the necessary options when downloading upcoming event data for Madison Public Libraries. This link is only relevant to the Print-copy/Web Services Page who works at MPL-Central. You may customize the bookmark links from the extension preferences page. All lists of libraries in LibLime Koha are sorted alphabetically. This includes, but is not limited to, the “Library” list on the login screen, the list to select hold pickup locations, and the list to select a patron’s home library. All text fields of a patron’s record are forced to be uppercase except for the email address fields which are forced to be lowercase. The city and state format for the City of Madison is forcibly “MADISON WI” and library staff may enter “mad” as a shortcut for a “MADISON WI” address. This feature ensures that a patron’s ‘session checkouts’ appears at the top of the screen regardless of how many waiting holds or special notes appear on the checkout screen. This feature disables many of the rarely used input fields which appear while editing a patron’s record. This encourages library staff to maintain a consistent system of data entry across patron accounts. This may be overridden to enable all input fields by checking the checkbox at the top of the patron edit page. If you are logged into Koha as one of the MPL libraries, this will even more greatly reduce the available input fields when creating a new web-use only account. Additionally, the address, PSTAT, and circulation note fields will be automatically filled in according to MPL and SCLS standards. This feature ensures that an item’s checkout history is sorted completely chronologically. By default, the table will be sorted by checkout date in descending order (i.e. most recent checkouts will appear at the top). You may choose to sort the items by checkout date, due date, or return date in either ascending or descending order. There is also a box to check if you wish to group the items by barcode number. A checkbox has been added to the Holds Shelf Action page that enables staff to separate CD holds from all other holds at the bottom of the table, sorted alphabetically by the patron’s last name. This feature adds a checkbox to the patron edit page in Koha to more easily toggle SMS notifications on or off. The checkbox moves a patron’s email address (if there is one) to the alternate contact section and prepends “T1-“ to the primary phone number (which is assumed to be a cell phone number). Unchecking the box will reverse these changes. Because this checkbox only moves data around on the patron edit form, a phone number (and, optionally, an email address) must be entered before using the checkbox. Similarly, checking the box cannot 100% guarantee that the patron’s data is properly formatted for receiving text messages. Contact Lucas if your library would like access to this feature. If you try to checkout an item to a patron with a barcode that is not a 14-digit number starting with “3”, a warning is displayed on the Fast Bib Add popup message warning that this is not a standard barcode number. This feature is designed to help prevent staff from creating fast-adds from raw RFID tags, which show as a 14 character string, usually starting with “E”. The following features may be turned on or off from the extension’s preferences page. By default, they are all enabled except “Disable dropbox mode” which is disabled by default and is discouraged from use by MPL. “Select a display” determines which logo is used for the extension’s toolbar icon. [Contact Lucas] if your library would like its logo as an option. This option removes the predefined patron message “Special Note” provided by LibLime Koha, which is rarely or never used by MPL staff. Additionally, selecting the checkbox for “Include notes for returned mail and bad emails” will include messages for mail or library cards returned by the post office, email addresses not being recognized, and email boxes being full. When creating or updating a patron record, compare their address against MPL’s list of dorms, restricted addresses, and unacceptable addresses. Dorm addresses are given a special expiration date of May 15 of that academic year. Restricted addresses are automatically made limited use, and unacceptable addresses trigger the save button to be hidden (which could be overridden by staff). In each of these cases, staff are notified of the nature of the address, and a circulation note is automatically entered into the patron’s record. 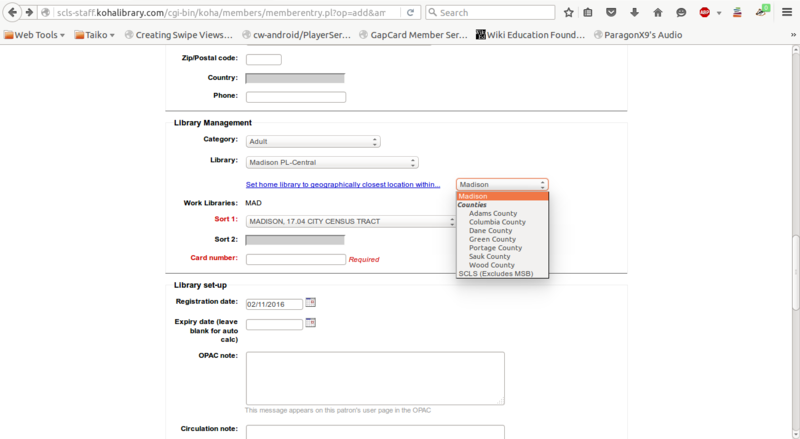 Because a patron’s library card number is used for their OPAC username, this feature automatically enters the OPAC login when a barcode is scanned into the barcode field. This feature will attempt to automatically enter the zipcode and PSTAT for any address. It is important to ensure that the street address, city, and state abbreviation are entered and correctly spelled. It starts with the most recent census data, and falls back on the 2010 census data. This will look up the census tract number for Madison address, and the county subdivision for addresses both within and outside SCLS. The cities of Middleton, Monona, Sun Prairie, and Verona select the PSTAT based on the patron’s aldermanic district. You also have the option to find the SCLS location that is geographically closest to the patron’s address. You may search among the MPL locations, within one of the seven counties, or within SCLS as a whole. This is particularly useful for reciprocal library patrons or those who have recently moved. This feature automatically selects the “Digests Only” checkbox (when applicable) and sets the advance notice options to “2” (days) when checking the email column of the patron notification option list. This feature forces staff to select either the “Due Date” or “Advance Notice” notification options, but not both, in order to avoid messaging conflicts resulting in the failure to send any notification. This feature generates the middle initial field based on the value entered for a patron’s first name. This feature will allow you to update a patron’s account type from juvenile to adult or limited use juvenile to limited use upon saving their record if the patron is at least 16 years old on the day you are editing their record. You may choose to have a patron’s barcode print in size 36px font (used by MPL) or size 28 font (requested by Monona library). If your library would like the font size to appear larger or smaller than the two available options, please contact Lucas. Automatically checks “Dropbox Mode” on Sundays. If enabled, unchecking the box for dropbox mode on Sundays will disable it for 3 minutes (unless manually enabled). This Firefox extension is developed by Lucas Schneider, a Page II at Madison Public Library, Central. If you run into any bugs, enter “about:addons” in the Firefox web address bar (without quotes) or “chrome://extensions” in Google Chrome, go to the options page for “MPL Koha Patch,” and disable the feature causing problems. If the problem does not persist after disabling the feature, send Lucas an email with a description of the bug. This extension has been vetted for security by SCLS, however, it is neither supported nor endorsed by LibLime or SCLS. It is independently developed by Lucas Schneider, a Library Page at MPL-Central. Please use the extension only at the discretion of your circulation or departmental supervisor.